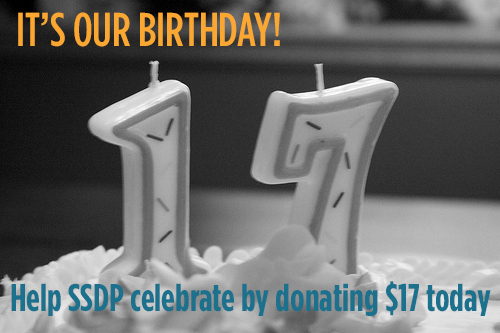 Make a One-Time Donation for SSDP's 17th Birthday! Students for Sensible Drug Policy was founded in 1998, and today we're celebrating turning 17 years old. Help us celebrate our "birthday" by making a one-time donation of $17 or joining the Sensible Society with a monthly donation of $17 today. SSDP is a 501(c)(3) organization and contributions are tax-deductible. SSDP is 17 years old! SSDP Welcomes the James Madison University (JMU) chapter!